Abraham Lincoln died less than a week after Lee’s surrender at the Appomattox Courthouse and the cessation of official hostilities. In a predominately Christian nation, it was virtually impossible not to see a correlation between his mortal wounding on Good Friday and the sacrifice of Christ. Upon his demise, the nation was plunged into deep mourning, not only for the death of the president, but also for the 620,000 men who perished. 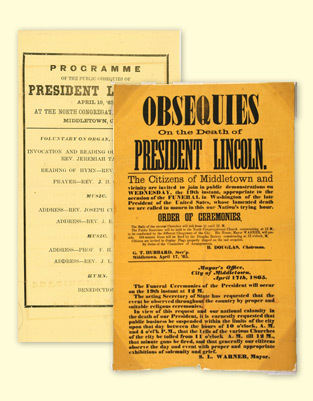 In many ways, the services for Lincoln served as the funeral for the thousands of men who were buried far away from their homes. As late as 1910, fewer than 15% of Americans died away from home. For the families of those who died or simply disappeared, the war left a void that would never be filled. More than 2% of the nation was dead as a direct result of the war and it produced a scar that the country carries to this day. During the Civil War, a time where men did not carry any sort of official identification and where the weapons of destruction could literally disintegrate a body, over half of the dead remained unknown. Sometimes a family was fortunate enough to have a comrade write to them of their loved one’s death, but all too often a soldier just disappeared. Of the 110 men who served from Greater Middletown who are listed on the Roll of Honor, 63% have no known grave. Of those with known graves, twenty-seven are buried in Connecticut, mostly in Middletown, while the remainder found eternal rest in the military cemeteries at Fredericksburg and Richmond, Virginia, Andersonville, Georgia, and nine other national cemeteries. 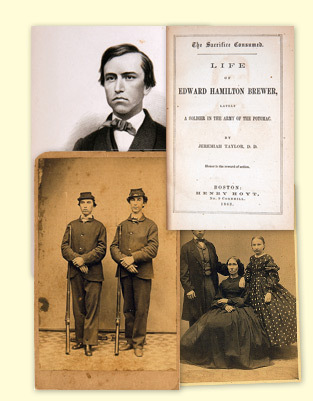 Edward Hamilton Brewer (1842-1863) enlisted in the 14th Regiment Connecticut Volunteers as a private in August 1862, the same time as his cousin William Edward Starr. When he ventured forth with his company, he left behind his widowed mother and two younger sisters. He was eventually detailed as a clerk to General French’s headquarters and was often able to dine with his cousin William. Brewer’s closest friend, Amos Fairchild, with whom he mustered in and had this picture taken before they left Middletown, died of disease March 8, 1863. Brewer was devastated by the death and wrote to his sister “I was very sorry last night to hear of the death of Amos. He was as dear to me as a brother. In fact, I called him such. The news of his death came so unexpectedly that I was not at all prepared for it…Little did I think when he left the regiment that I should never see his face again on earth. But I trust we shall meet again in heaven.” They would meet sooner than any had expected, as Brewer himself died of disease on April 2, 1863, less than a month after his best friend. Almost as soon as the war had ended, the people of Middletown sought a way to honor their citizen soldiers. 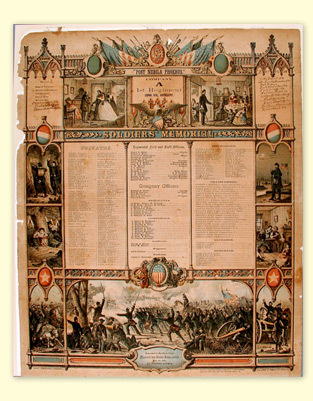 Discussion of a monument began in 1865 and the Monumental Association was formed in June 1870. 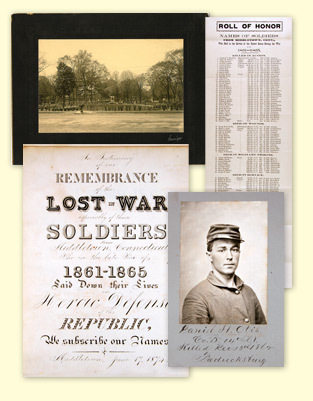 The group set about collecting funds for the monument in Union Park and assembling photographs and names of soldiers from Middletown who had died in the nation’s service. The Roll of Honor contains 110 names of soldiers who perished during or shortly after the war, probably of injuries or illness from their enlistment. The Memorial Book assembled together 76 photographs of Middletown’s dead. The Monumental Associations efforts were wide reaching and over 505 citizens contributed the dollar or more required to sign their name in the Autograph Book. The monument itself was dedicated on June 17, 1874 with speeches, music, and hymns. For an entire generation of men, women, and children, the Civil War was a turning point in their lives. They fought on the battlefront, fought the war of production in the factories, or fought the war of daily survival on the homefront. Dwight Pierce returned from his service and went on to live as a farm laborer, teacher, and piano key maker who retired to the Old Soldiers Home in Cromwell. This memorial to Company A 1st Regiment Connecticut Volunteers was one of many mass produced items that appeared after the war. A soldier could fill in the relevant information on his company and then display it for all to see. Henry Cornwall also returned safely, he was later a state representative from Portland where he worked as a manager in a brownstone quarry and later in the same position in a bank. Prior to his death in 1898, he spent countless hours touring the great battlefields of the conflict, gathering up the remnants of the war, bringing them home and assembling them into the collection seen here. These two relics of war, sober reminders of what the country had been through, were meant to be displayed, possibly in a formal parlor or family room. What went through the minds of former soldiers when they remembered their experiences? What did the civilians who lived through the war remember best? What can we still learn from these tales of death, destruction, sacrifice, and bravery from all those many years ago?